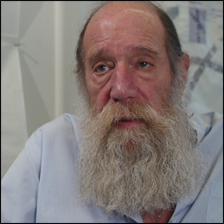 Lawrence Weiner (born in 1942) is one of the central figures in the formation of conceptual art in the 1960s. His work often takes the form of typographic texts. Weiner created his first book Statements in 1968, a small paperback with texts describing projects. Statements is considered one of the seminal conceptual artist’s books of the era. He contributed to the famous Xeroxbook published by Seth Siegelaub in 1968. Weiner’s texts describe process, structure, and material, and though Weiner‘s work is almost exclusively language-based, he regards his practice as sculpture, citing the elements described in the texts as his materials. In 1969, he was among the American contingent of artists that participated in the legendary exhibition curated by Swiss curator, Harald Szeemann entitled Live in Your Head: When Attitudes Become Form at the Kunsthalle Bern.